We hope that you will be pleased with your purchases from The Oxygen Store. However, there may be occasions when you will need to return items to us or cancel an existing order. If any items were damaged in transit, we ask that you report it to us within 7 working days (please note that this is 48 hours for our business customers). If the items are visibly damaged on receipt, it's best to sign the carrier's delivery note accordingly. Items should be returned in their original packaging complete with all accessories and documentation. For large and bulky items, or Hazardous goods returns please call us on 0345 100 0084 and we will arrange a collection on your behalf. Once received back into our warehouse, we'll issue a replacement or full refund to you via your original payment method. If your items are faulty on arrival, you have 7 calendar days in which to inform us of the fault (please note that for our business customers, this is 2 calendar days). Items should be returned in their original packaging complete with all accessories and documentation. Once we have verified the fault, we'll issue a replacement or full refund to you via your original payment method. If you are a Private Buyer and have simply changed your mind about any item ordered and you wish to return it, (subject to certain exclusions) then in line with the UK Consumer Contracts Regulations 2014 you can do so provided you inform us of your decision within 30 days of receipt of the goods. The item must not be used and must be 'as new' and in their original sealed packing when returned to us, please note that should you return any item that has been opened, or used we are unable to issue a refund. 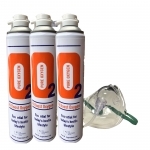 Oxygen Cylinders, Oxygen Cans, Oxygen Concentrators, Oxygen Masks, Tubing and Cannula. Once you've informed us that you wish to return goods under the Consumer Contracts Regulations 2014, you have 30 calendar days to do so, at your own expense. Once the item is received, we'll issue a full refund for the product either by cheque or to your original payment method. Please note this policy has some limitations and does not apply to business customers. For order returns from Business Purchasers we deduct a re-stocking fee of 30% of the item value, excluding VAT and excluding delivery charges returns are only accepted within 7 days of receipt of the order. Still need to return an item? 13.2 Returns will only be accepted in an unused and un-opened condition, items returned to us opened and used will not qualify for any refund. 13.2.1 A deduction may be made if the value of the goods has been reduced as a result of you handling the goods more than was necessary. The extent to which you can handle the goods is the same as it would be if you were assessing them in our Showrooms or a shop. 13.3 In particular, please note that any items returned to us which you claim to be faulty or incomplete are checked and verified by our technicians. Any returned items that are found not to be faulty or incomplete will be returned to you and we shall be entitled to charge you for the return carriage costs and an inspection fee via your original payment method. 13.3.1 In the event that your credit card has expired, or is declined we will hold the item(s) until full payment has been made for the return carriage. 13.4 Any items that you return to us are at your own risk, therefore we strongly advise all our customers to take reasonable care when returning any items to us for example, by ensuring the goods are correctly addressed, adequately packaged, and carried by a reputable carrier and you have a traqcking no and proof of delivery provided. 13.5 All returns/ Cancellations from Business Purchasers will be subject to a the deduction of a 30% cancellation/ re stocking fee. Returns must be notified and returned within 7 days of receipt of the order. 13.6 Special Order Bespoke items may not be returned or cancelled. 13.7 Refunds will be made within 14 days of our receipt of returned/cancelled items.